TrojanDownloader:PDF/Domepidief.A ransomware uses sophisticated techniques to infiltrate computers and hide from its victims. Use Reimage to determine whether your system is infected and prevent the loss of your files. TrojanDownloader:PDF/Domepidief.A virus is a cyber threat that spreads using an infected document from a download link planted on spam email attachment. TrojanDownloader:PDF/Domepidief.A is a trojan that enters via spam emails and propagates other viruses, resulting in a infection of multiple threats simultaneously. The malware derived from Emotet virus family, and, while very similar, its distribution method differs slightly. Previous variants of the virus used a very common distribution method – a malicious attachment in spam emails. This time, however, crooks decided to attach a PDF file (presented as an invoice) that contains a download link to the malicious MS Office document, obfuscating the built-in scanner efficiency, and making the scam more believable. 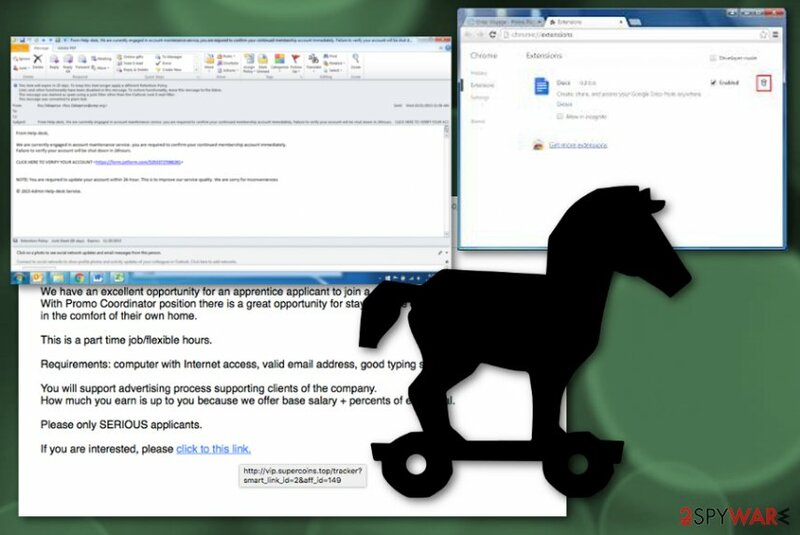 The presence of TrojanDownloader:PDF/Domepidief.A malware might very quickly result in ransomware, crypto-miner or banking trojan infiltration. 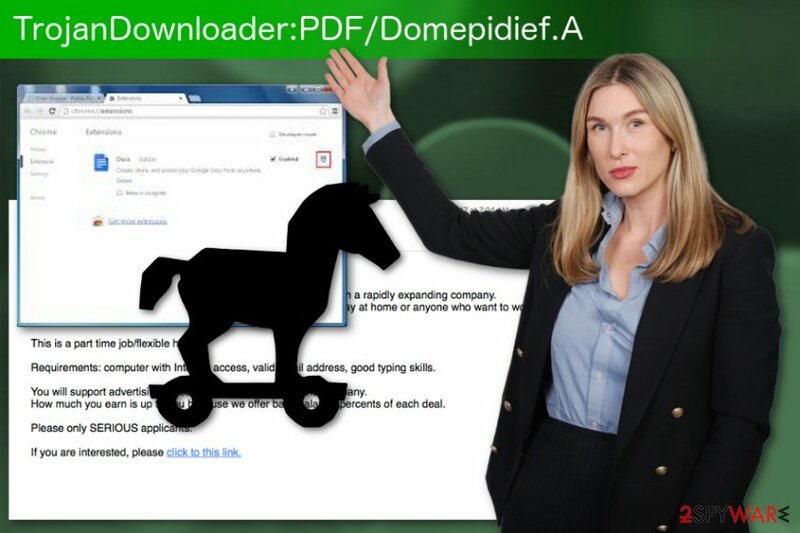 TrojanDownloader:PDF/Domepidief.A is linked to Emotet virus, which is known to security researchers from 2014 as a banking trojan that is capable of stealing banking information. Additionally, malware is known to perform denial of service attacks (DDoS) attacks on other systems. TrojanDownloader:PDF/Domepidief.A is a high-risk virus that can perform in many different ways. It spreads when people are tricked to download a document form a download link hidden under “get your invoice” or similar text. Please find attached your invoice for recent services. The contents of this email and any attachments are confidential to the intended recipient. They may not be disclosed to or used by or copied in any way by anyone other than the intended recipient. If this email is received in error, please delete the email. Those who click on the link, open the PDF file that contains a hyperlink where the payload of malware is hidden. Messages and links might look legitimate as cybercrooks are using – at first – reliable Microsoft files. However, they might not know that these files might be infected with malicious macros that hide TrojanDownloader:PDF/Domepidief.A malware inside. You need to remove TrojanDownloader:PDF/Domepidief.A immediately because this is a dangerous malware. You should get rid of this virus entirely with your antivirus program. If the trojan is blocking it, the best solution is to reboot your device in Safe Mode and then perform a system scan. After TrojanDownloader:PDF/Domepidief.A removal, do not forget about certain changes that might have been done to your machine – those need to be reverted. Researchers advise using a PC fixing tool like Reimage as soon as the virus is eliminated or fixing Windows Registry manually (the latter should only be performed if you are highly trained in the IT field). TrojanDownloader:PDF/Domepidief.A is a virus designed to proliferate other malware like ransomware, trojans, and keyloggers. To properly remove TrojanDownloader:PDF/Domepidief.A and you should use a reputable antivirus program. Trojans should always be eliminated by using professional tools instead of trying to remove malware manually. Sophisticated cyber threats are created in a way that only qualified cybersecurity specialists can perform a full elimination manually. Malicious processes can prevent TrojanDownloader:PDF/Domepidief.A removal using automatic tools. In such case, you should enter Safe Mode with Networking and launch the security application from there. We explain how to do that in the instructions below. Log in to your infected account and start the browser. Download Reimage or other legitimate anti-spyware program. Update it before a full system scan and remove malicious files that belong to your ransomware and complete TrojanDownloader:PDF/Domepidief.A removal. When a new window shows up, click Next and select your restore point that is prior the infiltration of TrojanDownloader:PDF/Domepidief.A. After doing that, click Next. Once you restore your system to a previous date, download and scan your computer with Reimage and make sure that TrojanDownloader:PDF/Domepidief.A removal is performed successfully. ^ Macro virus. Techtarget. Search security. ^ Dieviren. Dieviren. Spyware news. This entry was posted on 2018-09-24 at 09:34 and is filed under Trojans, Viruses. You can quickly scan the QR code with your mobile device and have TrojanDownloader:PDF/Domepidief.A manual removal instructions right in your pocket. How did you remove TrojanDownloader:PDF/Domepidief.A?